The return of the prodigal son (B91), 1636. The image size is 15,6 x 13,6 cm. The subject of this print is again taken from one of the parables. A man had two sons, one of whom demanded his inheritance in advance and left home. When he returned, having squandered the lot on loose living, he was nevertheless joyfullly welcomed home by his father (Luke 15:11-32). For this monumental composition Rembrandt borrowed heavily from a woodcut of the same subject by Maarten van Heemskerck. 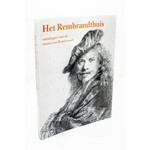 According to the inventory of 1656 Rembrandt had copies of numerous Van Heemskerck-prints.